The has a back pack carrying system enabling the folded kayak to be carried in its own built in rucksack, it also comes with a carry bag. The newly designed seats give it better back support. It is very stable and suitable for use on river, lakes and along the coastline. It features 3 independent air chambers, 2 Boston valves and a jumbo captive valve in the floor. Skeg (optional) attaches to the stern (back) and increases real speed (progress in straight line) by 25% for beginners and 10% for experts. 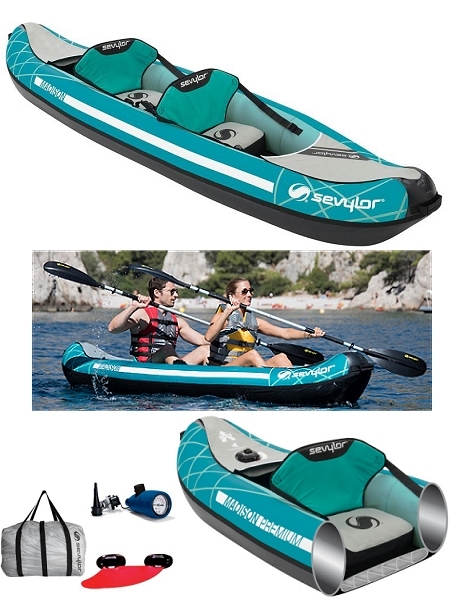 The New Sevylor Tahiti Plus has a new back pack carrying system enabling the folded kayak to be carried in its own built in rucksack, it also comes with a carry bag. The newly designed seats give it better back support. It is very stable and suitable for use on river, lakes and along the coastline. Rogue™ is designed as a sit-on-top utility kayak for all-purpose recreational use, diving and exploration. The wide outline and open transom offer excellent stability and allow for easy re-boarding from the water. Built using high-quality materials such as 600D polyester and Duratex™, the Rogue™ is an ideal kayak for all-around recreational paddling and sit-on-top utility, especially where re-boarding the boat from the water is a regular occurrence. Includes two supportive Whitewater™ seats with tall, ergonomically shaped backrests and large mesh storage pockets. The seats offer integrated fishing-rod holders and an infinite adjustment system allowing for precise tuning of the cockpit. Includes sturdy transport handles and accessory straps. Rogue™ is an excellent fit for anyone in search of outstanding value in a sit-on-top style kayak. Stores easily in just about any closet. Duratex - Uses heavy duty polyester fabric-reinforced hull material specifically engineered to take a beating. Quick release Fin - Stiff, durable, high-performance fin keeps the boat tracking and connects with convenient quick-release. White Water Seat - Supportive and durable, the Whitewater™ Seat offers a tall, ergonomically shaped backrest, closed-cell seat cushion, fore & aft straps and a large mesh storage pocket. Rod Holders - Each seat includes integrated fishing rod-holders and a large mesh storage area. Rogue™ is designed as a sit-on-top utility kayak for all-purpose recreational use, diving and exploration. 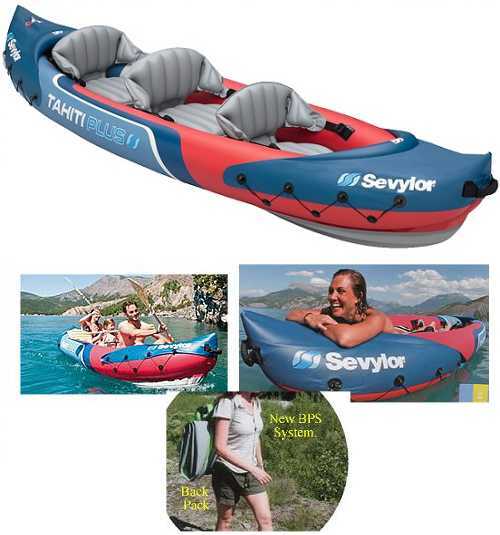 Easily fits up to two paddlers. The wide outline and open transom offer excellent stability and allow for easy re-boarding from the water. Built using high-quality materials such as 600D polyester and Duratex™, the Rogue™ is an ideal kayak for all-around recreational paddling and sit-on-top utility, especially where re-boarding the boat from the water is a regular occurrence. Includes two supportive Whitewater™ seats with tall, ergonomically shaped backrests and large mesh storage pockets. The seats offer integrated fishing-rod holders and an infinite adjustment system allowing for precise tuning of the cockpit. Includes sturdy transport handles and accessory straps. Rogue™ is an excellent fit for anyone in search of outstanding value in a sit-on-top style kayak. Stores easily in just about any closet. Quick release Fin - Stiff, durable, high-performance fin keeps the boat tracking and connects with convenient quick-release. Can be used Solo or Tandem. The NEW COLORADO was released in 2012 and combines the extraordinary mix of manoeuvrability, stability and comfort of its predecessor with unrivalled ease of inflation, deflation and transport. Versatile in use, Colorado™ features Single Interface Valves and the new Easy inflation Manometer: paddlers can inflate Colorado™ easily at the correct pressure. 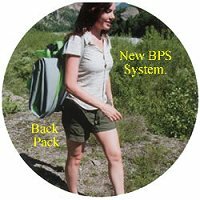 The Backpack System adds on userfriendliness in packing and transportation. Roomy and comfortable, the Hudson™ is perfect for a family day out, touring along sheltered coastline or on inland waters. 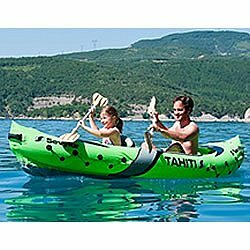 This sporty kayak not only looks great but also offers great performance and space for two adults and one child. Stable and comfortable, the Hudson™ offers easy tracking, with directional strakes and removable fins to add to its manoeuvrability. 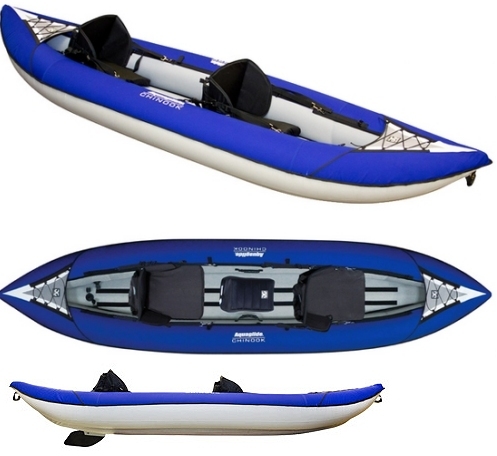 Hudson Canoe + Two Bravo 2 Piece Kayak Paddles (230cm in Length) + Stirrup Pump. 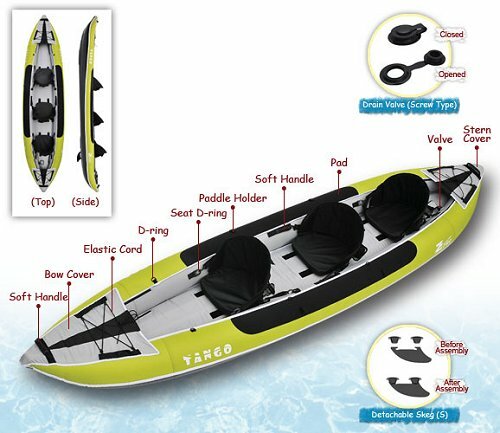 The Tango TA200 is a premium kayak made by Zebec one of the worlds leading inflatable manufactures, it is suitable for rivers, lakes and the sea. 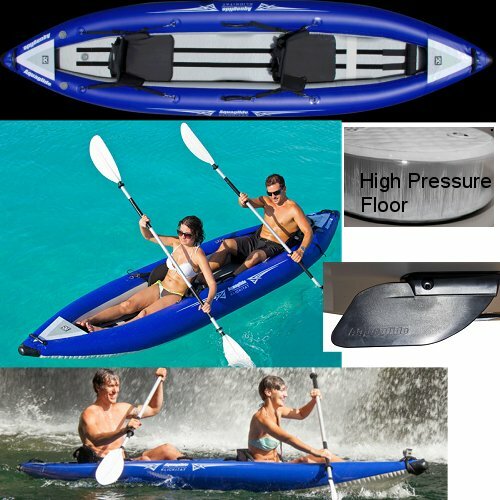 Its distinguishing features are its 1000 Denier fabric on the floor, and 850 Denier Fabric up the sides makes this kayak extremely durable and sleeker through the water, its high pressure H3 valves in its side chambers are similar to that which you would find on Ribs and marine tenders, allowing more pressure in the bladders, as well as a boston valve floor giving the kayak a nice rigid feel. It has spray skirts at the front and rear, high backed seats offering great lumbar support. in a central position to aid solo paddling. 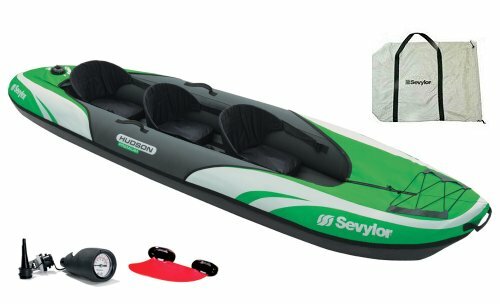 + Two Bravo 2 Piece Kayak Paddles (220cm in Length) + Stirrup Pump. 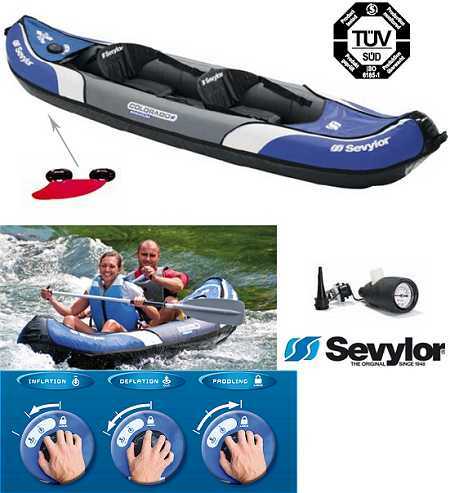 + 2 Sevylor Performance 230 two Piece Kayak Paddles (230cm in Length) + Stirrup Pump. Foot Rest - Adjustable foot rest improves comfort and paddling efficiency. Cockpit Drains - Threaded cockpit floor drains allow for easy water drainage. 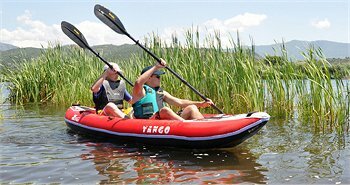 The Tango TA300 is a premium kayak made by Zebec one of the worlds leading inflatable manufactures, it is suitable for rivers, lakes and the sea. 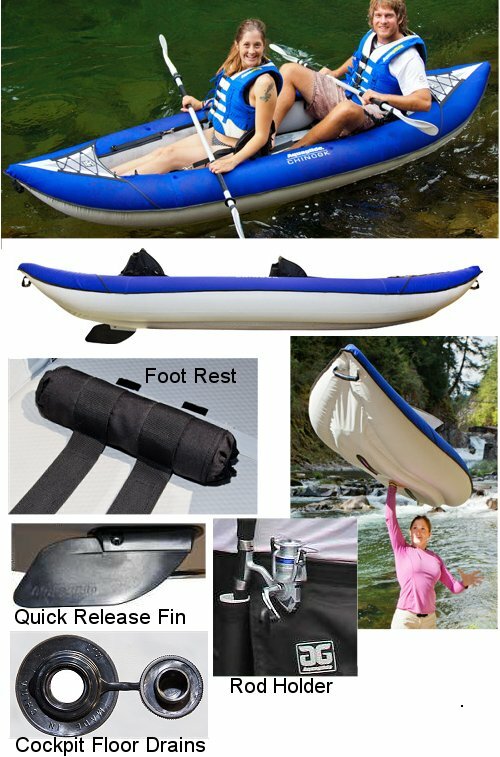 Its distinguishing features are its 1000 Denier fabric on the floor, and 850 Denier Fabric up the sides makes this kayak extremely durable and sleeker through the water, its high pressure H3 valves in its side chambers are similar to that which you would find on Ribs and marine tenders, allowing more pressure in the bladders, as well as a boston valve floor giving the kayak a nice rigid feel. It has spray skirts at the front and rear, high backed seats offering great lumbar support. 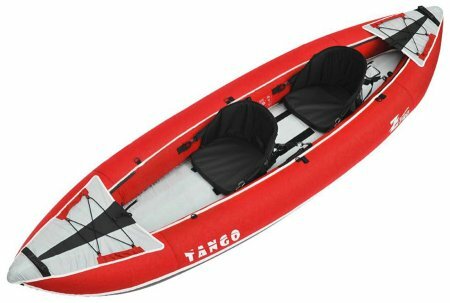 Tango TA300 Kayak + Two Bravo 2 Piece Kayak Paddles (220cm in Length) + Stirrup Pump. 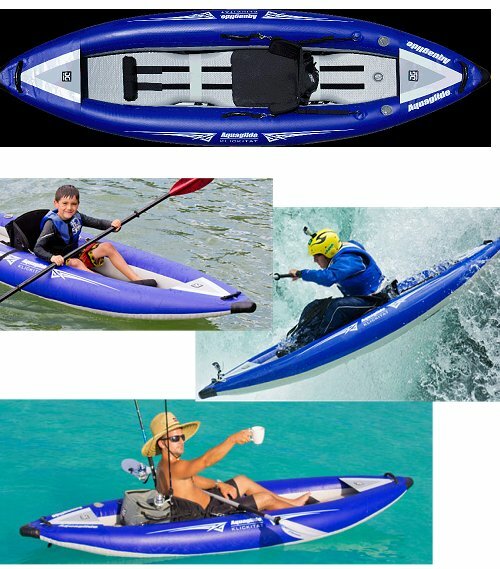 Tango TA300 Kayak + Two Sevylor Performance (230cm in Length) Kayak Paddles + Stirrup Pump. 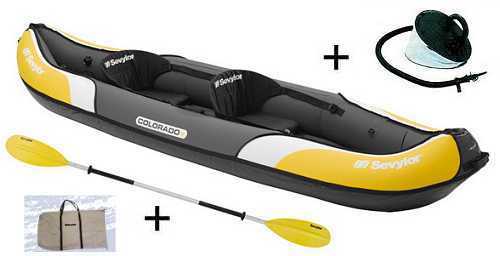 The Chinook Tandem is an excellent family kayak and designed for all-purpose recreational use, angling and exploration. Comfortably fits two adults with room for a third passenger, a pet or gear. The wide outline offers plentiful cockpit space and excellent stability. 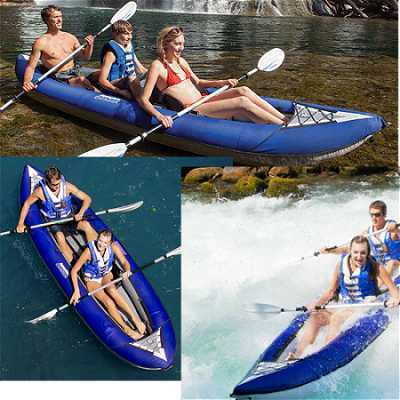 Built using high-quality materials such as 600D polyester and Duratex™ (Although not as thick as the PVC used on the Tango TA300 it is equally as strong as it uses the lighter weight much more pliable latest grade of PVC material), Chinook™ Tandem is an amazing value in an all-purpose tandem kayak. Includes two supportive Whitewater™ seats with tall, ergonomically shaped backrests and large mesh storage pockets. The seats offer integrated fishing-rod holders as well as fore and aft seat straps and an infinite adjustment system allowing for precise tuning of the cockpit. The included Saddle Seat can be positioned near the center of the boat for a third passenger. Loaded with plenty of helpful features such as neoprene rail pads, sturdy molded transport handles and accessory straps, Chinook™ Tandem is perfect for all-around recreational use. Stores easily with included carry bag that fits easily in just about any closet. Over-sized carrying bag with backstraps. Includes two seats, jumper seat, carrying bag, foot rests, fin, instructions, repair kit. 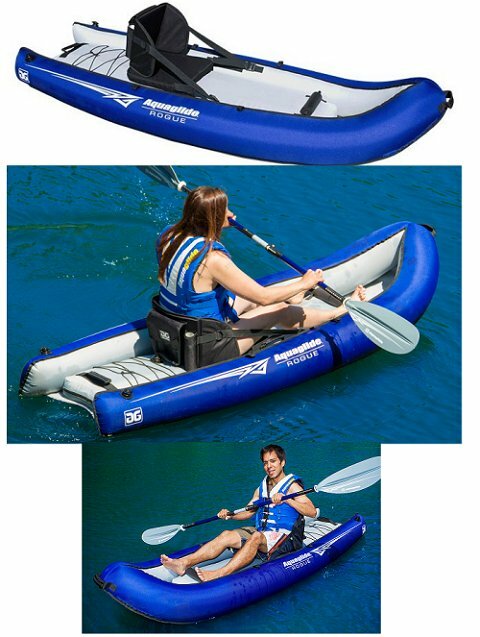 Chinook Tandem Kayak + Two Bravo 2 Piece Kayak Paddles (220cm in Length) + Stirrup Pump. 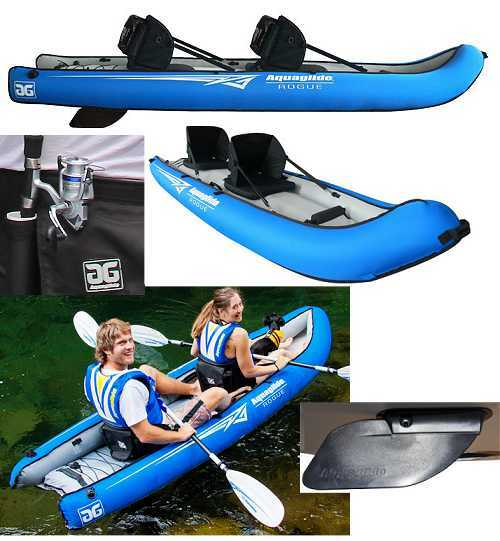 Chinook Tandem Kayak + Two Sevylor Performance (230cm in Length) Kayak Paddles + Stirrup Pump. The Madison Premium is the successor of the Colorado Premium, it combines an extraordinary mix of manoeuverability, stability and comfort with easy inflation system. 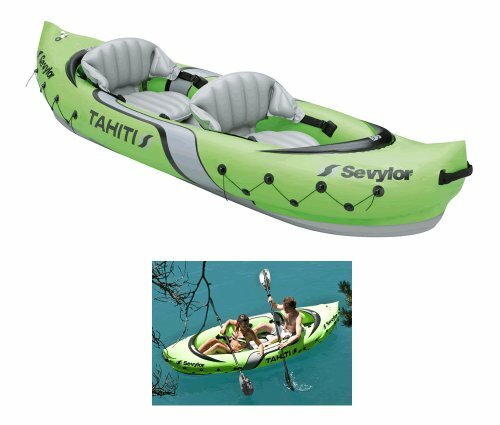 Thanks to its features such as the improved carry bag and new comfortable seats, the kayak offers endless fun on the water. • Easy inflation Manometer : Check pressure easily during inflation. • Highly Effective drainage system. • Integrated large spray decks at bow and stern. • New moulded side handles double function as paddle holders. Versatile in use, Colorado™ Premium is characterized by unbeatable easiness of inflation/deflation thanks to new Easy Inflation System and the new Easy Inflation Manometer. The Backpack System adds on userfriendliness in packing and transportation while the design with spray decks increase storage capacity and protect from water. Klickitat™ Series is designed for all-around paddling, commercial and whitewater use. Traditional river running outline provides exceptional stability with ample rocker for maneuverability and control in rough water. These boats combine our tough Duratex™ tube construction with the supremely rigid Hard-Bottom™ floor for an expedition-grade boat that will last for many years. Top-notch durability and performance for any adventure. Rigid Hard-Bottom™ floor adds stiffness, stability and unmatched paddling performance by integrating the floor and sidewalls into one tight package. Commercial-grade Duratex™ hull construction provides long-lasting performance no matter how far your travels take you. High-pressure HB floor creates a solid Hard-Bottom™ platform that feels every bit as stiff and responsive as a hard shell kayak. Plentiful cockpit drains allow the user to configure the boat for self-draining (white water), or dry use, as conditions dictate. Ample cockpit tie-downs provide plenty of stowage for dry bags and other gear. Sturdy molded handles are positioned around the boat for convenient boarding and transport. Rugged Core™ seats offer a wide array of thoughtful features including high backrest, mesh storage pocket, integrated fishing-rod holders, fore and aft support straps and an infinite adjustment system for maximum comfort. High-performance fin system includes stiff, durable, foiled fin with unique quick-release for easy setup. Convenient backpack travel bag included. To unleash the full potential we suggest using one of our High Pressure Pumps with HB boats. Pump sold separately, see Accessories page for pump options. Klickitat™ Two HB is designed for all-around paddling, commercial and whitewater use. The boat’s traditional whitewater outline provides exceptional stability with ample rocker for maneuverability and control in rough water. Comfortably fits two adults with room for gear. Rigid HP floor adds stiffness, stability and unmatched paddling performance by integrating the floor and sidewalls into one tight package. Tough, high-quality materials such as full Duratex tubes and hull wrapped around a supremely rigid, HardBottom™ (HB) design add supreme confidence and ensure a boat that will last for years to come. Klickitat™ Two HB includes two supportive Whitewater™ seats with tall, ergonomically shaped backrests, closed-cell foam cushion and a large mesh storage pocket. The seats offer integrated fishing-rod holders as well as fore and aft seat straps and an infinite adjustment system allowing for precise tuning of the cockpit. Plentiful cockpit drains quickly empty the cockpit in rough conditions. Sturdy molded transport handles, deck skirts and bomber bow & stern guards complete the package. Stores easily in a generously tailored bag that will fit in most closets. Integrated handles and padded backpack straps make this boat well suited for outfitters, anglers and river runners as well as exploration and adventure travel. Our Online Shopping Cart is powered by Paypal. Please note that you No Longer Need to have a Paypal Account and you no longer need to Sign up to Paypal in order to use our Shopping Cart Service as you did in the past, Where Prompted Simply Click I Do Not Have A Paypal Account if this applies to you and proceed with your transaction as per normal or if you are an existing Paypal User enter your paypal username and password where prompted. If you have any problems or queries please call us on 01600 775382.